The Monto Veterans Golf Carnival held on Friday 9 March 2018 was once again the best supported golf event on the Monto Golf Club calendar. 68 men and women golfers from Calliope, Monto, Mundubbera, Gladstone, Gracemere, Yeppoon, Injune, Moura, Biloela, Emu Park and Tannum Sands played for trophies donated by Taylormaid Quilts, Craig Swift, Bundaberg Pro Shop, and Monto Veterans Golf. Paul Irvine and Helen Irvine from Monto took out the major trophies with Don Ney from Calliope winning the overall Nett. The Monto golf course was presented in great condition due to hard-working volunteers and the favourable weather conditions this summer. 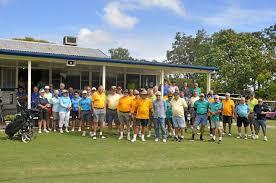 Travelling golfers took the opportunity to park their caravans in the golf grounds and extend their stay to include the chook run on Thursday. Golfers were very appreciative of the excellent lunch and smokos provided by the Monto Vets ladies while the bar-staff (Leesa Ison and Alan Little) kept the players well hydrated. The field of 57 men and 11 women is an excellent field for the Monto Veterans Golf Carnival and it is a credit to the players who travelled up to 300 kms to compete.